Roasting unpeeled winter squash also makes for a striking presentation. That’s a pie pumpkin above and a hefty acorn squash pictured above, but you can use this technique with any squash that you can manage to hack apart. I especially appreciate this approach when I’m dealing with a ribbed or bumpy squash that would be a serious hassle to peel uncooked. (Alternatively, just stick to squash with edible peels and you avoid the trouble altogether.) 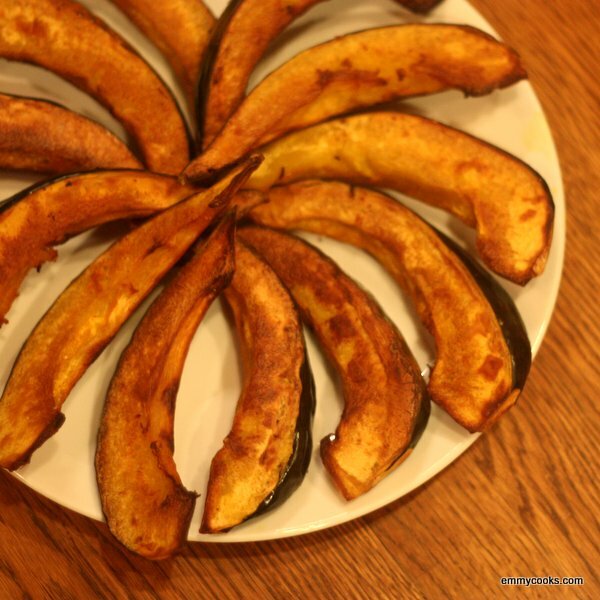 Roasted Winter Squash Wedges: Halve each squash (watch your fingers!) and scoop out the seeds. Slice each half into wedges that are 1 1/2″ to 2″ wide at the widest part (watch your fingers!). Rub with olive oil and a sprinkling of salt. Arrange on a baking tray so every piece is touching the pan and bake at 400 until the first side is golden (start checking after 15 minutes). Turn the squash to the second side and repeat. Bake until both sides are golden brown and the squash is tender when pierced with a knife. Note: You can flavor the squash (think maple syrup, chili powder, Indian or North African spices, miso-curry paste) before baking—the acorn squash above was roasted with just oil and salt; the pumpkin used both of those plus maple syrup and ancho chili powder. I love this option for incorporating a new vegetable into our menus. Thanks. That’s a great idea, Emmy! Acorn squash are a total pain to peel raw. In fact, I haven’t bought one in years for that reason. No need to avoid them now! Don’t think we have winter squash around here. The only types we have are butternut, pumpkin and zucchini. Interesting to roast squash with miso though, that’s something I’ll have to try. I don’t ever peel squash anymore, it’s too much hassle. That acorn looks lovely!